Episode five of ‘Her Lovely Heels’ turned out to be very mellow and dramatic, but that’s not always bad. Our couple experiences obstacles and problems in their relationship like how every other couple does, but it’s just whether they’ll be able to get out of the hole they dug themselves in and be able to push past all of that that counts in the end. Episode five starts out with a happy and excited Tae-soo driving to Ji-hoo’s house with the cake and gift that he bought for her resting in the back of his car. He tries to reach her by phone, but when she doesn’t pick up, he begins to get suspicious. Back at Ji-hoo’s apartment, she’s stepped a few feet away from Yunho in order to give him some time by himself. He’s still sitting outside of her apartment, drunk and unconscious. Ji-hoo texts Hee Eun, Yunho’s ex-girlfriend, and informs her about Yunho who’s outside of her house right now and asks for her to pick him up. She then notifies Yunho about her request to Hee Eun which upsets him so he calls Hee Eun and tells her to not come anymore because he’s already left, but Hee Eun is as fast as the speed of light, for she arrives at Ji-hoo’s house within a time span of 2 seconds. Yunho was about to leave, but Hee Eun ended up coming before he could leave. She walks past him and up to Ji-hoo, then slapping Ji-hoo afterwards. Hee Eun warns Ji-hoo to never interfere between her and Yunho ever again. But Ji-hoo is strong-headed and fierce; she slaps Hee Eun back and argues her side of the story. Their argument is heated and very hateful, but an angry and confused Tae-soo interrupts them. Hee Eun tries to blame Ji-hoo for getting herself attached to her Yunho, but Tae-soo doesn’t blame Ji-hoo because he’s not interested in Ji-hoo’s past. He is fully aware of how much Ji-hoo likes him and that’s all that matters to him. When Hee Eun and Yunho leave, Tae-soo notices Ji-hoo’s injured hurt and scolds her for running barefoot on glass. He ends up applying medicine on her feet and taking care of her even though inside he’s angry. When Ji-hoo apologizes for the scene that occurred a few moments ago, he reveals that he’s angry at Ji-hoo even though he doesn’t know if he is allowed to be or not. He adds that he is aware of how much Ji-hoo liked him which is why he eventually dated her. But after hearing what Hee Eun told him, he became alert and realized just how much Ji-hoo used to like Yunho back then. Tae-soo doesn’t give Ji-hoo any chances to explain herself; he adds, “While dating me, just like how you did when you dated him, you might get hurt.” Oof, I felt like a bullet just went straight through my heart. How can you say something as hurtful as this Tae-soo?! 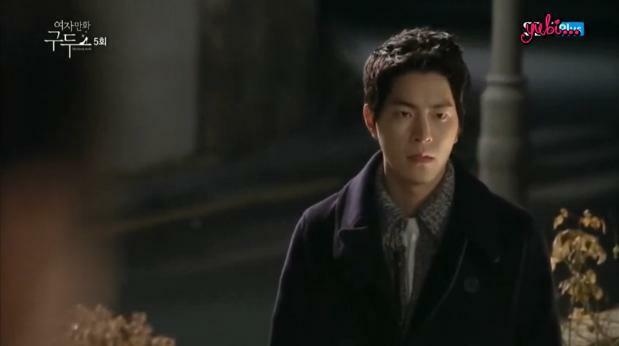 He asks Ji-hoo if he’s fine knowing that she could also get hurt, but she is speechless. She can only stare at Tae-soo while tears form in her pale and fragile eyes. Tae-soo ends up leaving a hurt and confused Ji-hoo at home who is unable to stop crying. Tae-soo also spends some time thinking and reflecting upon his words in his own house. The night is a bleak night. The next day, Ji-hoo arrives at work and walks past Tae-soo’s desk. 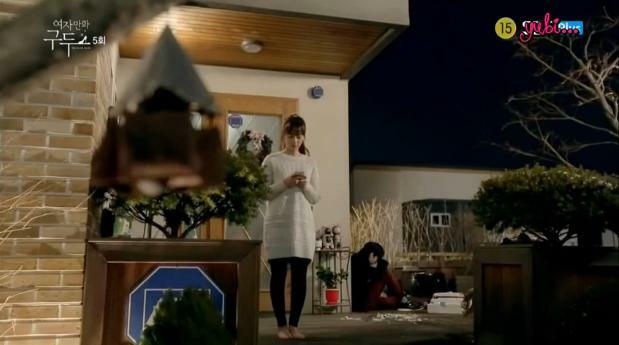 She stares at it reminded of Tae-soo and his harsh words. Meanwhile, Tae-soo is with Manager Im who has just finished some work. When their boss (or whoever the guy was) leaves, she suddenly grabs onto his arm and places her arm in his. Tae-soo is concerned over how someone might see them, but Manager Im can care less. She asks for him to spend some time with her because she’s lonely and would like to talk with someone. They then agree to go eat dinner together. While at Manager Im’s house, Manager Im reveals that it’s her birthday. Tae-soo is sad that he couldn’t have gotten a present for Manager Im, but she responds by saying that her gift is sitting right in front of her. (omg wut. did you just really say that right now?). Tae-soo laughs it off and thinks Manager Im’s joking when she says that she likes him, but Manager Im isn’t playing around. She adds, “Tae-soo, when I see you only, my heart beats. You used to only be a friend and a younger brother. You changed into a capable man. A cooler and sexier Oh Tae-soo. I like you.” Tae-soo is surprised and shocked at Manager Im’s surprise confession, mainly because he never thought of her the same way. That’s when Manager Im states, “Let’s get married.” A hesitant Tae-soo looks nervous and confused as to what to say next. Meanwhile, the drama shows Ji-hoo waiting outside of Tae-soo’s house then transitions back to Tae-soo and Manager Im inside of his house. The episode ends by showing us the transition back and forth many times to remind us of the difficult situation that all 3 characters are placed in. Ji-hoo is located outside of Tae-soo’s house waiting for him patiently while Tae-soo and Manager Im are inside deciding upon their future together.